This is a very significant view. Why? Because a large part of the discrimination and oppression of women through the ages has been precisely because of the distorted, even hateful views surrounding mother, Eve. By association with this incorrect view of Eve, women have been viewed as the stupid/weak ones who really mess everything up all the time. And we as women? We have a whole lot of guilt for our womanly feelings, intuitions, sensitivity – and it seems that much of that is tied back to those incorrect views of Eve. But, in reality we shouldn’t feel ashamed of being women. Eve was incredible! If we study her story we can understand some pretty wonderful things about our heritage and gifts as women, and have confidence in our femininity and contributions to our families and the world. Anyways, let’s get back to Eve. 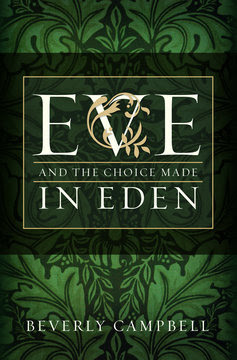 I just read a phenomenal book about Eve called, Eve and the Choice Made in Eden by: Beverly Campbell. I highly recommend it to anyone and everyone who still struggles with some of the more ambiguous or uncomfortable elements of the story of Adam and Eve. Because, as it says on the back cover of her book, “Understanding what happened in the Garden can change your life.” Profound and true? I think so! Campbell compiles many quotes and scriptorians’ insights into the verses surrounding the Eve story in one succinct, quick, and very thought-provoking 180 page read. Here are a few of my questions that were answered from this book. I will write my questions and direct quotes from Campell’s book as response. Why did God give two apparently conflicting commandments to Adam and Eve? What does helpmeet mean exactly? The word seems to indicate a lower status. What does transgression mean exactly? It’s not sin. . . but the connotation seems negative? What does the word beguiled mean? Was Eve just tricked or did she understand her choice? How does the Eve story apply in my life? What do I learn about what it means to be a righteous woman from Eve? These are just a handful of the gems in this book. There are many more I would like to share, but I’m pretty sure I’d have to quote whole chapters to illustrate the wisdom contained in them. And, probably Beverly Campbell wouldn’t appreciate me doing that. ;) Suffice it to say that this is a beautiful, empowering, insightful book and I really think you should all read it. 5 stars!!! I’m currently studying the minutes from the first meetings of the organization of the church’s Relief Society in Nauvoo (the largest women’s organization in the world – the women’s organization for our church), where Joseph Smith gave specific counsel to the women there. You can find those at this link. Also, I’m gearing up to read, The Gift of Giving Life, as soon as I save up a few more dollars of fun money. :) Maybe as a birthday gift?! Did you read that, honey? ;) Friends, study along with me if you like – or just read about what I discover as I share it here. Just know – all you women out there are awesome and beautiful and very very loved by Father in Heaven. I highly recommend you do yourself a favor and go read and study about our Mother, Eve. And then, get your husbands to read about her, too. We would all do well in coming to better understand this critical story. How has your understanding of the story of Adam and Eve influenced your life? In Sharing Time today we talked about rules and commandments and it made me think about the quote you shared from this book from Dr. Nehama Aschkenasay. While a rule may change, there are certain things that can't/don't change, right? Maybe that applied to the garden as well? There are several great pieces of the puzzle here. I especially love Sheri Dew's comment. Thinking of Motherhood as a divine right and state of being, and not merely as the point at which one bears children, is very empowering to me personally. Thanks, Jami! As I was reading this, I thought, "She needs to read The Gift of Giving Life!" Then I saw you were already planning to! Did you enjoy it? I haven't read this book about Eve yet--but I hope to now! Hey friend! So, I googled Dr. Nehama Aschenasy and your page, this page, was the first to pop up in my feed! Woot Woot! Thanks for your insight. It is always enlightening.